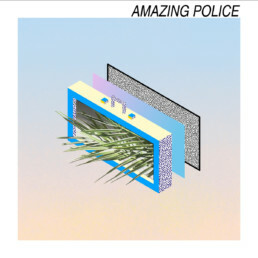 Amazing Police is the Synthwave project of bassist/producer Are Johansen Ormberg, based in Oslo, Norway. His sound is reminiscent of 80’s movie soundtracks, library music and electro pop, drawing inspiration from the period specific music of Prince, Miles Davis, Vangelis, Giorgio Moroder, Weather Report and Herbie Hancock. His production style deploys a combination of modern computer production methods combined with 80’s analog and digital hardware, as well as electric bass and guitar. This, combined with an affinity for nontraditional form and structure and non-functional harmony as found in jazz fusion, conjures up sounds that are simultaneously nostalgically familiar and original and new. After one EP (Moroder-Einstein theorem, 2013) as well as several individual tracks, and having collaborated with other synthwave artists such as Highway Superstar and Quixotic, May 2018 saw the release of his self-titled debut LP on Rosso Corsa. The whole album has a clear, crisp sound, and a new sheen of consummate professionalism that really gives the songs a big boost.